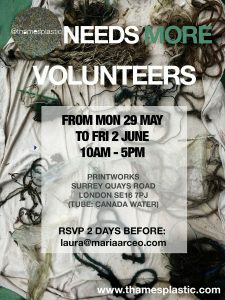 Come join artist Maria Arceo with the plastic she has collected from running over 40 beach cleans along the Thames foreshore with Thames21‘s help. Now she needs your help to sort all the plastic items and prepare them for the next phase of her artistic installation and workshop. The huge amounts of plastic will be used to show the public just how big and serious the issue of plastics in the river is. You only need to come and be ready to get dirty (bring old clothes and shoes! 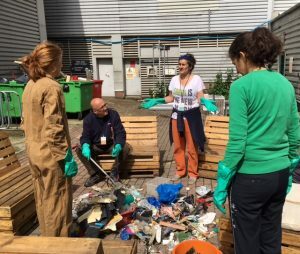 ), whilst having the opportunity to learn first hand about the types of plastic objects that end up in the Thames, and that would ultimately find their way into our oceans. Gloves, pickers and cleaning materials will be available onsite.